Heartbroken Plano East players watch the Cowboys celebrate after their defeat of the Panthers to win the Class 6A Region I Championship. Coppell won 2-1 to move on to the state semifinals on Friday, April 15. MIDLAND – Facing a Plano East team who was in the middle of a magical playoff run, who was not expected to make the trip to Midland, who were 45 seconds away from being knocked out in the regional semifinals, the Cowboys knew the Panthers were going to ride their momentum of their incredible streak. But in the end, the Coppell soccer team (22-0-2) proved that it was there for a reason, that it is not all hype, that its state No. 1 ranking is no fluke, taking advantage of scoring opportunities and playing suffocating defense to defeat Plano East2-1 to become the Class 6A Region 1 champions and move on to the state tournament. Moving on, the Cowboys will go up against Katy Cinco Ranch at Georgetown’s Birkelbach Field on Friday, April 15 at 5 p.m. in the state semifinals. If they win, they will move on to the state final against the winner of Lake Travis and Brownsville Lopez on Saturday. Sophomore forward Wyatt Priest challenges a Plano East defender for the ball late in Coppell’s 2-1 victory over the Panthers in the regional final. Priest scored three goals in the regional tournament to boost the Cowboys to a state tournament berth. From the start, the Cowboys continued to play physical defense, keeping the ball in their attacking half for much of the first half. Their nonstop offensive aggression led to the creation of many opportunities in the final third. 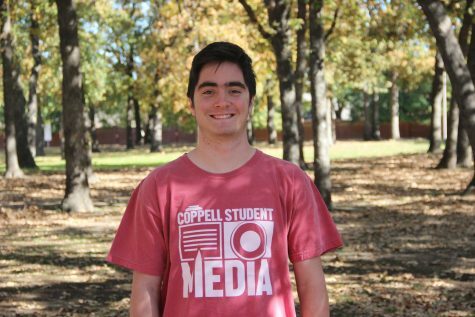 “When you get to the big games like this, and you get to the games far in the playoffs against great teams, you have got to be able to do both things,” Coppell coach Chad Rakestraw said. “You’ve got to be able to play both sides. We’ve got a great group of guys from back to front to do that. The Cowboy attack broke through early, and after Nick Taylor was fouled inside the box, the junior forward lined up for the penalty kick with the game tied at 0. 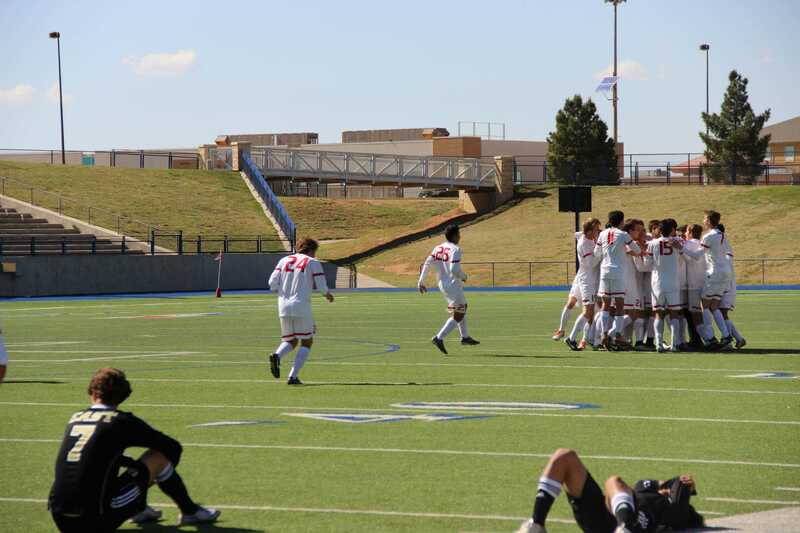 Taylor did put it past the keeper easily, giving Coppell an early lead. It wasn’t until late in the first half when East finally created a solid opportunity to score. A Panthers attacker ripped a shot off the bottom of the crossbar, where it bounced just out of the goal. 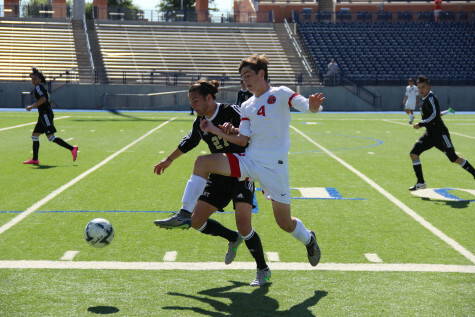 Senior forward Tanner Traw was quickly able to get back on the counterattack and get the Cowboys a corner kick. 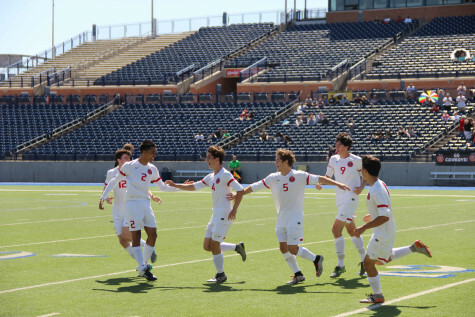 The Cowboys celebrate after sophomore forward Wyatt Priest scored on a header to put Coppell up 2-0 in the first half of the Cowboys’ 2-1 win over Plano East. In the win, Coppell captures a regional championship and a berth in the state tournament on Friday, April 15. On the corner, Taylor put the kick right on the head of sophomore forward Wyatt Priest for his fifth goal of the playoffs, giving the Cowboys a 2-0 lead at the half. Midway through the second half, the East attack finally found the back of the net for a breakaway goal to pull them within one. However, the Cowboys displayed their superior ability to maintain possession, and were able to grind out the 2-1 victory, winning the regional championship and moving on to the 6A state semifinals.